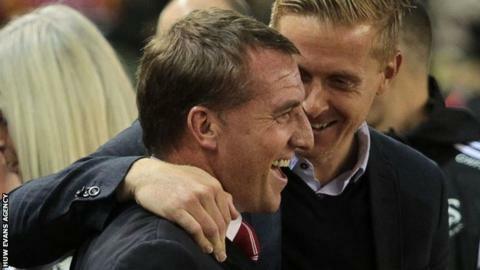 Swansea City manager Garry Monk says Liverpool were wrong to sack his mentor Brendan Rodgers. The Reds dispensed with the former Swans boss after Sunday's 1-1 draw at Everton, which left the Reds 10th in the Premier League, but the decision was made before the game. Rodgers left Swansea after their first season in the Premier League to take over at Anfield in June 2012. "I can't believe that. A very, very harsh decision," said Monk. "I don't think he deserved that at all. He's a top manager and that's a big surprise to me. "I was a bit in shock when I got told that." Monk says while he was a player at Swansea, Rodgers' influence helped his transition into management. Michael Laudrup succeeded Rodgers as Swansea manager before Monk took over when the Dane departed in February, 2014. Monk added: "Obviously I have to at some point try and speak to him [Rodgers] and for me, I can't see who else is going to do a better job for Liverpool at this moment in time so I am very saddened to hear [he has been sacked]. "He's a top manager and I learned so much from my time with him, especially about this side of it, about the management side of it. "He's the one that gave me the in depth insight into how that works and has been so supportive to me in this and he's a top, top man as well. "It doesn't make sense to me." Monk says his side's 2-2 draw against Tottenham Hotspur on Sunday showed they were "much more like ourselves" after going into the game having lost three of their previous four games. Andre Ayew's header for the home side was cancelled out by the first of two Christian Eriksen strikes from free kicks. A Harry Kane own goal put Swansea back into the lead only for Eriksen to again level. "You could see the passion and the desire we had to win the game was massive," said Monk. "We have performed fantastically in many games already this season, but we've had a couple where we were well below our standards. "According to some people, a three-game run is a blip, but I know my players have quality. "It's just a question of getting that out of them on a consistent basis. "We saw it here and hopefully now we can go from strength to strength." Spurs boss Mauricio Pochettino said his side had "maybe dropped two points" but Monk retorted: "They were never in the lead, so I don't know how. "Without the two free-kicks, I think we would have won the game and we certainly didn't deserve to lose it. "It took an incredible save [from Hugo Lloris] at the end to deny Fede [Fernandez] a winner, and I thought overall we performed very well."